I'm noticing that present()'ing a view with style = 'popover' doesn't seem to take the window title bar into account when popover_location is specified. I could be getting this wrong, but I'm trying to show the popover with its little arrow pointing at the icon-only button from which it is spawned. The view that button is in is a ui.View presented with style="sheet" on top of the main ui.View of my app. I don't add the popover view as a subview of anything, and even if I do add it as a subview of the sheet, it still shows up in the "wrong" place. Is there a way to get the title bar height programmatically? Right now I'm just hardcoding a number. Is there a correct way to get the popover_location value which will properly take into account the title bar? The sheetView has no superview() when presented, so I have no way of directly converting the center of the iconButton to a position in the presented sheet window...but perhaps there is a way I'm unaware of. @shinyformica, no time to look at this deeper now, and no iPad, but did you try @JonB’s view browser to look at the objc views for the popover? popover works funny in sheet mode. The popover is with respect to the containing viewwrapper's superview, not the window. This might be different on iPhone. where b is the button, v is root sheet. if b is several levels down, you'd convert to v first. See the sheet viewheirarchy with viewbrowser -- the highlighted view is v, note it has nonzero y.
i am not sure if there is a reliable way to detect "sheet"... though i recall a thread about this. You actually should be able to go direct from srcobj to topobjc.superview(). ConvertPoint is associative ..
As long as the coords you pass in are in the frame of the object you call convertPoint on, you are good to go. Out of curiosity... Are you creating a "help" overlay? One of my many unfinished projects was a menu system with a "help" button that popped up hints when touching a button, or perhaps long tapping a button shows help for that button. 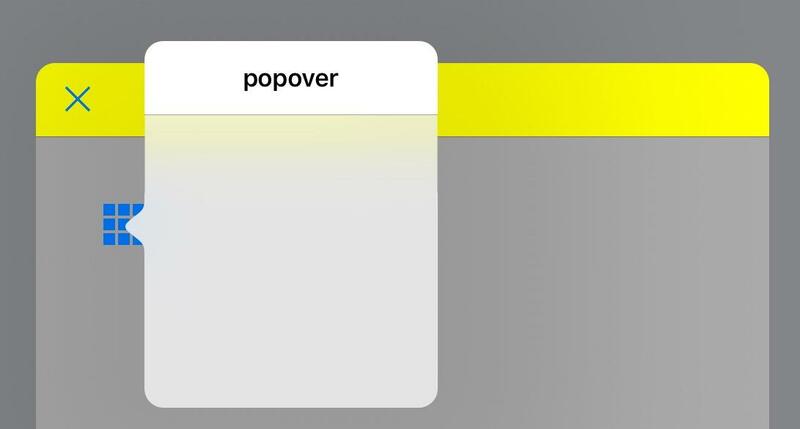 This is a popup to display a list of options to the user, so the popover has a TableView subview, and tapping an item in that view dismisses the popover. Working nicely now that it shows up where expected.